And place it in the same directory as the application. The app will look for it at launch. If it finds it, it will use that file in place of the schedule that comes with the app. When it finds the file, it will display a message indicating that, so you can verify it was read. Works wonderfully in Ubuntu Linux....Talking to a Windows machine running SDRdx. Excellent!I downloaded the lastest EIBI file, and the app stated using this local copy----it works great! Two issues have come up on my 0.0.2b2 version. 1) When I open the program, I get a repeating pop-up window saying that "this beta version has expired". 2) When I download the latest sked and renamed the file to sked.csv.txt, I was expecting some confirmation that the program was using it. This did not happen. I am also getting that message, but in the Linux version, the application appears to work, it sends up the "expired" message frequently however. It appears to be using my recently downloaded EIBI sked, though. 1. Got rid of the expired message. You're good until 2015. 2. You can put your sked.csv.txt file into the documents directory for your user account, and the SWBC Sked App will use it. This is the Mac location, for Windows I assume this is the Documents & Settings directory. I have no idea where this is for Linux :-) Actually, if the app finds the file there, it will display a message to that affect with the full path, so that will tell you where it is. 3. There is an option now for the app to check for updates to the sked.csv.txt file and automatically download it and place it in your documents directory (even if you have no idea where that is). 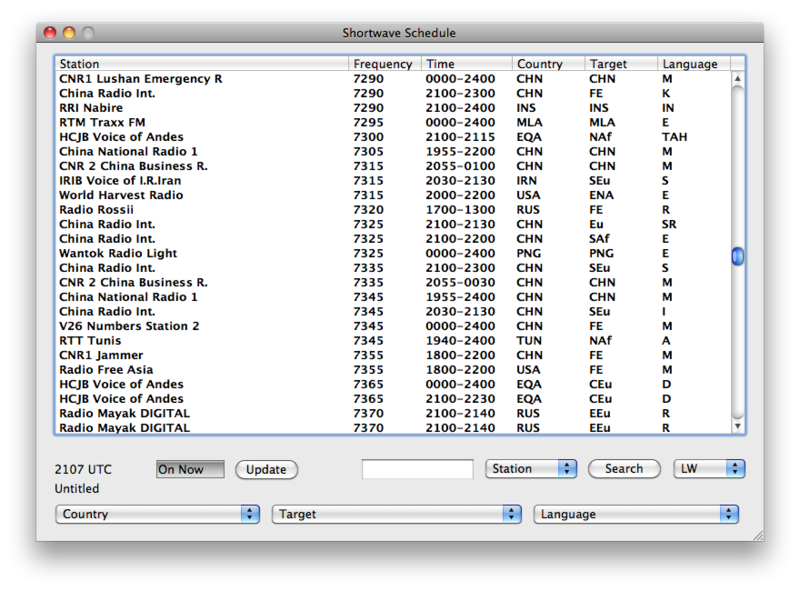 Go to the File menu and select New Sked Check, to check it. The app will now check for an updated schedule file, and will do so each time you start the app. I just realized it doesn't tell you if it has downloaded a new version, but you will see it in your documents directory, assuming you know where that is. I'll add something to display a message to that effect. OK folks, now try downloading 0.0.3b1 for Windows. The previous download link was still the older version. Any chance of an update now that its 2015 and the annoying pop ups have returned?